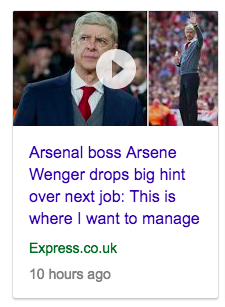 What next for Arsene Wenger when he finally closes the door on Arsenal and we can all forget about the nine years without a trophy, signing Marouane Chamakh and watching a side with all aggression of a newborn lamb? Unless, of course, the masterful manager steers Arsenal to the Europa League title and with it Champions League qualification, and we call agree that it’d be right and proper for Wenger to remain at the club for another season. Or longer. Don’t toss way those “Wenger Out’ banners yet, Gooners. Where? Bayern Munich? Spurs? England? Says Wenger: “I hope these are not my last European cup games – my target is to play in Europe again.” The hint is that he cole mange for any club in Europe. In yer face, Guangzhou Evergrande Taobao.